RHYS BOWEN: As you read this I will be doing something quite different and amazing. I will be attending the opening of a play at the Unicorn Theater in London. 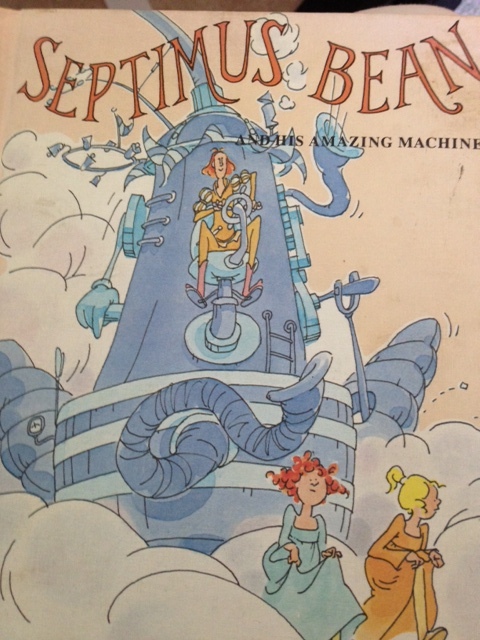 And the play is based on a children's book I wrote many years ago called SEPTIMUS BEAN AND HIS AMAZING MACHINE. How cool is that? I've never seen my work performed before on stage. I've seen a few things on TV but by the time they came to the screen they weren't really mine. A strange looking man who was both long and lean. and he came with a strange and amazing machine. And it seemed (from the ground) to reach up to the sky. It had wheels, it had bells, it was painted bright blue. But the king asked "Septimus, what does it do?" Septimus doesn't know, so the royal family has various suggestions, none of which work, all of which are disasters. Then the king suggests the thing has wheels. It must be a new fangled carriage. Septimus tries it out. it gathers speed, goes up the drawbridge and takes off. And sighed "What an ending to Septimus Bean." "I'm not ended, King Al. I'm up here in this tree." Where in twenty two parts lay the broken machine. Septimus Bean looked it over, and sighed. "It's hopeless," he said. And the princesses cried. "You'll soon build another, I'm sure," said the Queen. "You'll fly through the air once more, Septimus Bean." "The world must wait. I'm going to bed. I'll never more try to invent a machine. You can all just forget about Septium Bean." climbing all over the bits of machine. "Look mother, look father," the princesses cried. "We can swing, we can climb, we can seasaw and slide." So Septimus has invented a playground and is a hero. Did any of you read this book when you were young? Oh, Septimus Bean . . . class after class, this was a favorite of my first graders, Rhys. How amazing and wonderful that it’s been turned into a play. I’m looking forward to hearing more about that! You WROTE that? Wow. I loved this book and, sadly, had forgotten it. Am off to find a copy for my grandsons. They are all just the right age. Children respond so positively to poetry. It's not just the content but the rhythm of course. God save the iamb! Congratulations on the play. Hope to see it locally one day. What a splendid story, Rhys! Congratulations on the play. What a thrill. I never read the book, but wish I'd had it for my sons. There's a special place in my heart for kids' books and poetry and theatre and, wow! to have it all together for a book you wrote--just WOW! Enjoy the experience, Rhys and the child in all of us will share your joy! Rhys, this is wonderful and amazing and we can't wait to hear about what it was like on stage. I never read that book, but my grandchild-to-be will!!! Oh! I had no idea! Somehow I missed it, but I will make up for it like crazy now. This is wonderfully fabulous, and I can't wait to hear all all all about it Congratulations! This really IS fabulous! What a delight!! 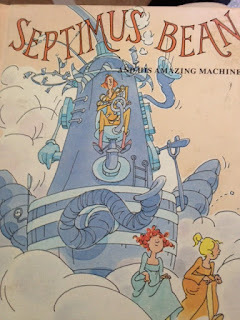 How did I miss Septimus Bean, and the cover illustration is great - I see there are used copies on Amazon... may have to get one, you know, for the grandkid. How wonderful, Rhys! I never read it, but the rhythm and verse are lovely. I hope the play is fabulous and look forward to the report. Oh, my gosh, Rhys, I read that to my kids! It was a library book and we took it out SEVERAL times. I had forgotten, and of course that was before I knew you, so I never made the connection. The number of authors I know who have had a work adapted for the large or small screen is rather high - but I've never known anyone who had a play come out of their book! That's amazing. Congrats and enjoy the experience. Rhys, how wonderful!! I hadn't read Septimus Bean but am going to look for a copy for the granddaughter! And of course I am so envious of you being in London and how amazing to see a play produced from your book. Huge congrats and enjoy! Just back from the play which was quite wonderful and very funny. Actor who played Septimus was delightful and it was amazing to hear the children in the audience laughing and shrieking out. That's wonderful, Rhys. I'm afraid I totally missed Septimus back in the day. Rhys, what a wonderful book! I don't know how I missed it when my kids were little. Like Hallie, I immediately went to Amazon and looked it, and I'm looking at the different options. I still love children's books, so it will be for me, but I will share it with my younger granddaughter. It must be absolutely thrilling to have your book taken to the stage and performed. You are a great spinner of tales for all ages. Rhys, congratulations! What a great story. I missed Septimus, but I suspect that's because he hadn't been born at the time...trust me, I would have adored the book! Enjoy the play. How cool is that. That will be the best play ever . . . and the most playful! I just ordered it for my soon to be grand daughter.